A couple years ago, I thought I wanted to be a fabric designer. I thought I might have a chance at having my art licensed. I have seen many artists take this route and so I decided I had better figure out how to build a pattern repeat. Most of my surface design is rather random and doesn't repeat. It is printed or painted by hand and when you are designing that kind of fabric, there is no need for motifs to be ordered and repeat exactly. If I was going to design fabric, I knew I was going to have to learn how to properly make a pattern repeat. I decided to teach myself fabric design using Adobe Illustrator - part of Adobe's Creative Suite. I have worked in Illustrator for years, but mostly for drawing charts for my knitting patterns and books and schematics. I knew that Illustrator worked with "vectors" which means that any design you draw can be increased in size a million times and the different bits and pieces would not become pixelated. If I were to design in Photoshop or simply scan an illustration, when it was blown up, there would be the chance of pixelation. I spent about 3 weeks, off and on, teaching myself how to design repeats in Illustrator. There was a steep learning curve and lots of frustration but I wanted to conquer it. I used this book and this book and this video. And then I uploaded the designs to Spoonflower, the digital fabric printing website. I ordered some 8 x 8" samples of my fabric designs and once I was sure that the fabric was the color I wanted them to be, I got a couple of the designs printed. I used them for projects in my book Crafting a Colorful Home. You can see and order my fabric designs on Spoonflower here. If you do, I will get a commission of 10% of the fabric sale as a credit towards my own fabric purchase. These are some fabrics that I had printed of my own design. I made them into Tea Towels to sell at our recent Open House. Like with lots of things I learn, I lost interest. Some things I continue with but some things I just drop. 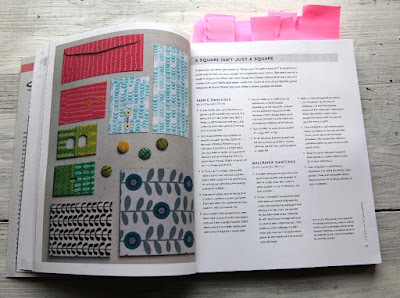 I knew I was not well-connected within the quilting industry - that is an understatement - I know pretty much no one. I also got wind that the fabric designers that do get licensing deals really don't make that much money. You can read a good article by Abby Glassenburg about that here. And so I dropped the idea and moved onto other projects that I felt had better payback and prospects for me. 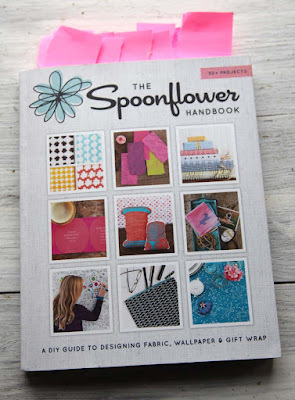 This fall a new book was published by STC/Melanie Falick Books called The Spoonflower Handbook. Boy, I wish this book was out when began teaching myself fabric design. It would have been the perfect starting point. I got a review copy of it and thought it would be a great time to share it with all of you. I know that many of you are interested in fabric and that after the holidays are over, you might spend time sewing. Maybe you might like to try your hand at fabric design too. The Spoonflower Handbook was written by Becka Rahn, Judi Ketteler, and Spoonflower founder Stephen Fraser. It is meant to be a beginner primer for those new to fabric design. 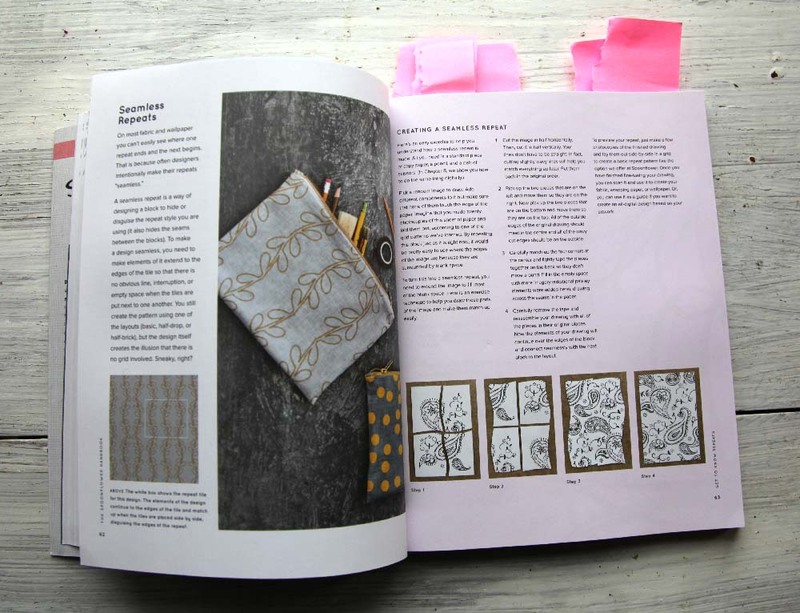 The first section of the book explains what you need to know to design your own fabric. They discuss the different fabrics they print on. Both vector and jpeg files are explained and how and where to use each one. 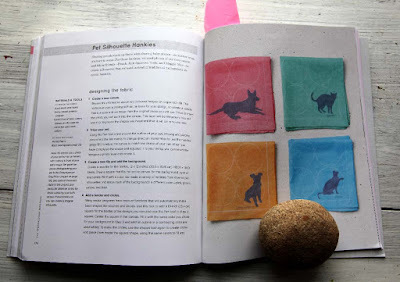 Working with color and the Spoonflower website is also explained. And then there is a section on working with repeats. The second part of the book gives thirty different project ideas. 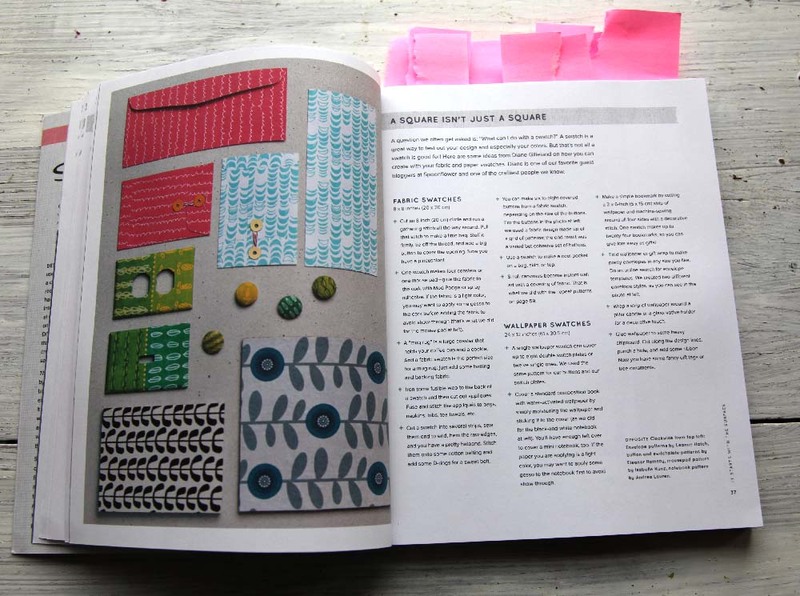 These ideas include how to design fabric and then sew projects out of the fabric you would design. 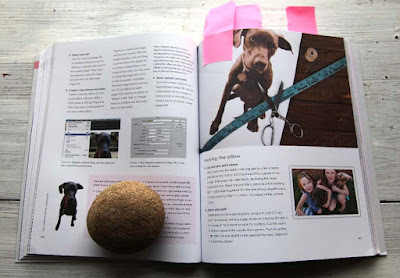 They have some cute ideas - scanning found objects, using photo images you already have on your computer, working with type and more. These are my favorite project ideas from the book. The Spoonflower Handbook is just the beginning for those of you interested in designing your fabric. 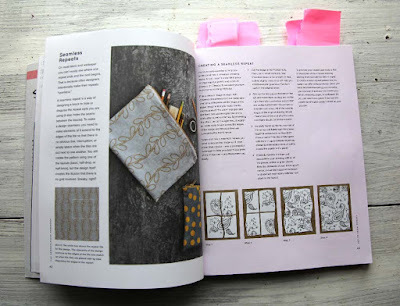 You and I might not get rich designing our own fabric, but it is a way to have unique fabric to use in your home or wardrobe. And now Spoonflower also prints wrapping paper and removable wallpaper too. I love the idea of this book. I had already set aside a drawing one of my daughters made of birch trees. I 'd love to use it for birch tree fabric, which I would use to make a set of napkins and a table runner. It would make a lovely wintery tablescape. I really hope I win the book. Thanks for all your inspiration. 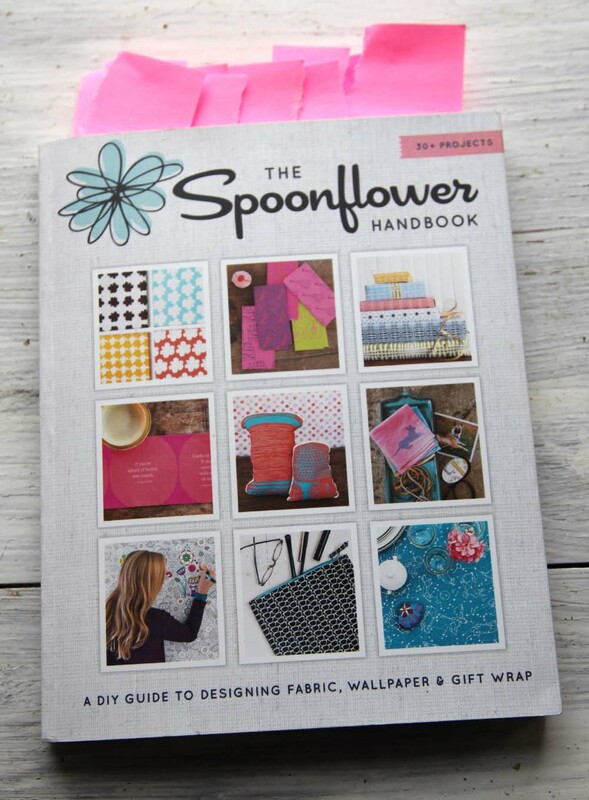 So here is what I have for one lucky reader.... Their very own copy of The Spoonflower Handbook donated by the fine folks at STC Craft. If you were to design your very own fabric, what would be the object you would make with it? US residents only. Contest ends December 21st at 11:59 p.m. As always, please leave an easy way to get a hold of you - blogger id, email, or Rav id. I love your idea of tea towels. I've got a couple of very graphic tea towels on the oven door 'bar' just because I love their color and graphics. 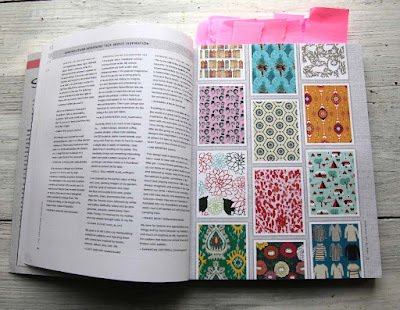 I also would like to redo the wallpaper in the kitchen and it would be so cool to make my own as every time I look in a wallpaper pattern book, the design is justttttt notttt quite righttttt. Hi! I have a chair. A really big comfy chair that I bought when my girls were little so I could sit with both of them and read. But after years of being made into a fort or climbed on by the dog or cats it was a mess. I spent a year covering it in patchworrked fabric. But even now the patches occasionally need to be replaced. I would design my own fabric and use it to cover the chair! I may just do it! This is a great book review and service on your part. I am a self taught novice and read everything I can get my hands on in order to learn. I would design big fat curtains, shower curtains, drapes, kitchen curtains, curtains to drape on the wall, etc. I look forward to the day when I will be designing interiors and a curtain has always been a great start, sorta kinda like a gift wrap. Thank you for this article and chance to add my comment. I didn't know aboutthis book. Can't wait to get my hands on it one way or the other. 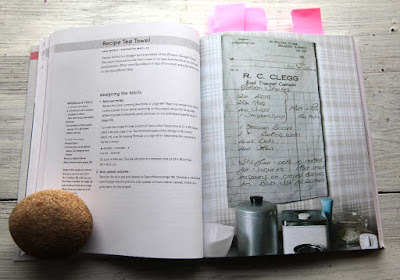 I saw a project idea on Martha Stewart blog suggesting a kitchen towel design made from copies of your mother or grandmothers hand-written recipes. Their hand writing was SO distinctive. I'd know my mom's hand anywhere. I'd love to make that fabric and sew those towels for myself, my sisters and brother. So many things I'd be inspired to make: a dog coat, and umbrella, a dress for myself, a duvet cover, pillows, table runner, floor cloth, you name it! I would make a quilt to keep me warm. bag, so I could show off my fabric! Thanks! Recently I am into creating toilletry bags, project bags and totes...plus taking an interesting print , adding embroidery and creating a pillow or popping it in a frame...if only my creativity meshed more closely with the real time I have to create! The salt water fish in coral reefs have a way with putting colors together in dynamic ways. It would be wonderful to take their cue and design fabrics with their "native costumes" in mind. Happy holidays in your little slice of heaven in the hills! I would make tote bags. I would love to create my own fabrics to make clothes for the grandchildren. I would use the scraps in quilts. I've been idly thinking about designing fabric for new bedroom drapes. You know, in my spare time. Wishing a very happy holiday to you and your tribe. I envision designing my own upholstery fabric to pick up favorite motifs and colors. I would make a pillowcase so I could enjoy the fabric EVERY single day! I would design fabric for a big, comfy quilt. I would make clothes for my children, a dress, a shirt... and also bedding. I think it would be a blast to design cut-out projects for kids, toys and bibs for charities. Also fun quilt block panels or applique. I have a recipe card that was handwritten by my grandma. It's her famous buttermilk pancake recipe. I'd probably print that and use it for aprons. I have a ton of cousins so I'd have to make about 20 of them! I would definitely make my own fabric design into window curtains. I think of curtains on a window or passage in the home to be an indicator of the mood of the home. Sometimes closed curtains mean privacy or closed thinking and need to just think in solitude. Sometimes have them open lets the flow of the world through to my interior and I think of things as "flowing" through the house. I know that if I liked a design enough to ordain my windows or walls or passageways, I would be inspired to be a wholesome person too. That's what I would create if I did fabric design. Thanks for all your inspiration. I went to the Spoonflower website just the other day after seeing it on your blog about your open house. Making tea towels, napkins, placemats would be my first project...I'm positive there would be more! ~ This book sounds fantastic !! * what a great review Kristin. I would like to create fabric to make pillow shams, child-sized napkins, kitchen towels, and most especially to make my own simple skirts, tunics & aprons. This all from someone who doesn't know how to use her sewing machine, . . . but I have ambitions. I acquired it from a knitting lesson trade. I would start with hand sewn & embroidered doll size quilts! I'd probably make an apron from my custom fabric. Unless I wanted to get really wild and crazy and make a sundress from it! Drapes. I know what I want and I can't find it ANYwhere. Sounds crazy with all the fabric choices out there but what I want is not currently available. I don't have three weeks to figure it out so a reference that could streamline the learning curve would be most welcome. I would have my silk scarf designs recreated onto different fabrics....the possibilities are endless!! I am starting to play with stamping on fabric again. In fact, I am working on setting up a small corner of my basement for a little studio! I am so excited and instead of seeing the basement as a disaster, it's a place of potential. With the stamped fabric that I want to make, I am planning on making project bags both for knitting and storing small juggling props. I'm also interested in dish towels, napkins, and pillow covers. Next year for Christmas, I'd like to have my niece and nephew over to stamp up some presents for family members. I would make a pillowcase or throw using drawings my grandson made over the course of his three years. Bookboxer1 at gmail dot com. Thanks Kristin! 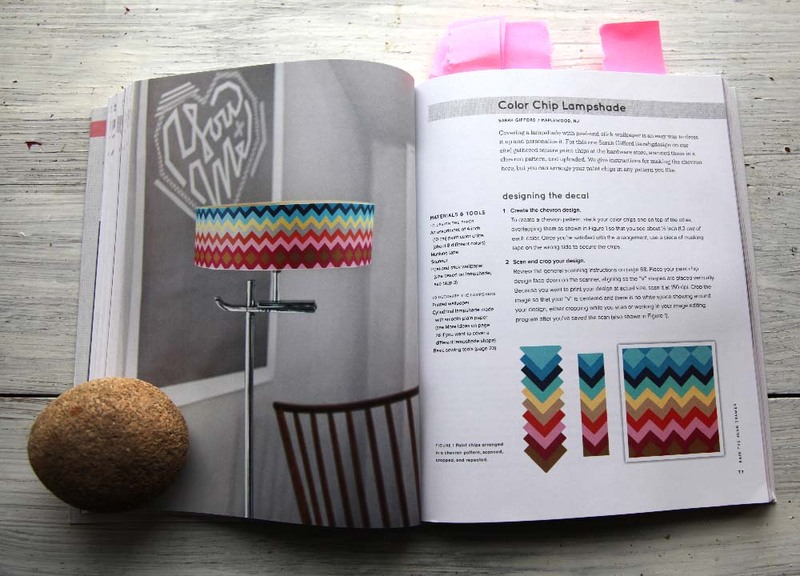 I'm a fan of your knitting books, and am hoping to get your new "Colorful Home" book soon! Thank you for sharing so much on your blog! I would quilt with my fabric. Lots of lovely, useful quilts to share with loved ones and possibly sell. I envision beautiful patterns that have a link to the past and are comforting and peaceful and calm. I do intend to design my own fabrics . . . someday. As always, love your blog, and love staying connected to New England now that I have moved to Virginia. Keep up the good work. You are an inspiration to so many. BUT, if I were to make "something", I'd probably make "pillow" covers for my wool blankets. I've noticed that once my crocheted wool blankets are finished and folded up, they're very springy like a pillow-form. So, I've been thinking that a nice, perhaps matching, pillow cover would be a great way to store them in..? I would love to make a dress from fabric I design. This book looks wonderful! I'd be so excited & proud of myself if I successfully designed a beautiful pattern, so I'd make a skirt or dress to wear! Merry Christmas & Thank you! Thanks so much for letting us know about this book! I would design fabric with an African theme to make colorful skirts or dresses. I would love to learn the proper way to design fabric! I'm a sock knitter, so I would sew some project bags. That is almost all I sew---I like to look inside my knitting bag and see something pretty. This sounds like a very interesting and helpful resource. 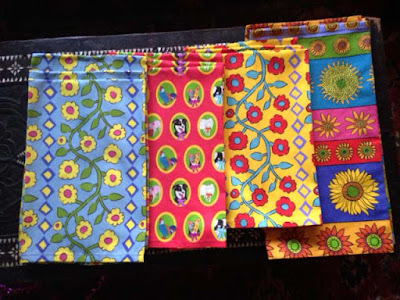 If I designed my own fabric I would make an item that would have an emotional attachment to it, maybe a baby blanket or memento for a special life event. I would also like to make something utilitarian that would be used every day so I could enjoy the fabric during my daily routine. Thank you for the post and the giveaway! I'm afraid I'm a little boring but I would love to make dishtowels from my photos.